Here I am at the start of a new year. 2008 really didn’t see that much gaming activity from me but hey, it’s not like this is a job or anything. According to the Master Play List, I only played (or made blog posts for) around 40 games (vs. about 150 for 2007). However, according to my notes, I actually played several games that just bored me to the point that I couldn’t bring myself to compose a proper blog entry or MobyGames record. Who knows, maybe I will get to those in 2009. I only managed to amass around 2500 MobyGames points in 2008 vs 7500 points for 2007, though I suppose that still represents a significant amount of effort, so I can’t be too hard on myself there. I have something ready to go for the new year– I have a good number of console games to cover (many are already in the database but need screenshots). These include mostly Sega Saturn games, but also some PlayStation 1 & 2, Dreamcast, and GameCube games. While there are excellent emulators for most video older (say, ROM-based) game systems, screenshots from more modern (say, optical disc-based) consoles are pretty difficult to obtain. I have long struggled to capture video from these consoles through different TV capture cards and most recently via a DV capture bridge. These solutions work adequately but the biggest problem is playing the game while capturing. All of the capture solutions introduce a slight lag which makes gameplay incredibly frustrating. However, I finally thought of a solution: an S-video Y-splitter. Once I thought of the idea, I visited Amazon to verify that such a device exists. Thus, for a game console that has S-video and stereo RCA outputs, split all 3 outputs, sending one set to a real, lagless television for playing and the other set to the DV capture bridge. It’s all a bit tedious to set up (hauling the TV into the same room as the computer, setting up all the cables), but once it works, it works well. The capture process, I mean. First, I have to suffer as the Sega Saturn CD console (pictured above) struggles to validate the old, used collection of Saturn games. 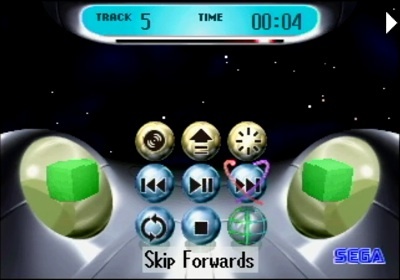 Mostly I get the familiar Gouraud-shaded VU cubes playing the red book CD audio tracks. But I’m pleased to report that I did get some games to work, and that once a few games worked, some previously rejected Saturn games started working as well (perhaps the console needs to warm up). It’s a real pleasure to play without input delay. Further, I have already discovered a few gems among my old Saturn stock that I look forward to writing up, and have captured hours of footage. The only problem I am struggling with now is properly capturing still images (software likes to squeeze the images to the wrong aspect ratio). I am confident I will work through that soon and transform myself into a console screenshot capturing machine. Ideally, I will be able to put together some decent gameplay videos for posterity as well.